We are Adam York Gregory and Gillian Jane Lees and we are artists with a collaborative practice, which combines science, visual art, performance, movement and durational art. Together we create work that lasts for a number of hours and includes multiples of objects and repetition. We were invited to pitch an idea for the BLASTED project and the idea that we were both very excited by, was to develop an installation of film, sound and objects. Our installation has three connected, but discrete parts. In the first part of our installation, we were keen to demonstrate our interest in potential and tension which was ever present at White Lund and which we can only hope to achieve momentarily in our arts practice. Adam and I have always had an interest in creating tension in our work. In our performance ‘Present Tense’, over the course of 5, 6 or 7 hours, I set 500 mousetraps across the floor in precise lines, using my bare hands and feet to measure that the distance is the same from one to the next. A consequence of doing so is the potential for my hands and feet to get caught in the traps, which creates a very subtle and intangible tension in the room. The accumulation of mousetraps equates to an accumulation of tension in the space, which Adam records through notation of the behaviours of those watching; hands covering eyes, eyes half closed in preparation of witnessing an injury. Sometimes I catch my fingers and toes in the traps and the audience are able to express relief at the tension being broken. Sometimes not a single trap goes off across those many hours and the audience hold that accumulated tension in their bodies when they leave. In a series of schools workshops, we set to work with nearly 100 local children in Lancaster City Museum. We introduced them to the idea of creating tension in a space and that often, we don’t realise how tense we feel until that tension is released. At the start of each workshop we discussed explosions and the notion of potential; the potential for something to be dangerous, to ignite or to explode and what it might have been like to work in an environment which had the potential to be dangerous. We talked them through a very basic experiment which involved filling film canisters with paint and sodium bicarbonate, sealing them, shaking them rigorously and setting them inside a sealed transparent tent which we had lined with paper to allow us to capture the effects of the explosions. Some canisters would explode immediately but others would take 45 – 60 minutes to go off which created a subtle but palpable tension in the room. Adam took each of the ‘explosion paintings’ and amalgamated them into a looped animation, soundtracked by the voices and actions of the children making explosive noises. It has been claimed that true expertise is reached at 10,000 hours of practice, a fact that has fascinated me for years. If we consider the physical ability of the women and girls who worked in the factories of White Lund, their bodies performing seemingly effortless repetitive movements for great durations, day after day, experts in their own bodies’ capabilities and limitations, I am astounded by their accomplishments! It felt relevant to Adam and I to commemorate those incredible feats. The BLASTED team put a call out for local women to take part in a commemorative action to be filmed as part of our installation. We were thrilled to receive interest from a group of twelve women, varying in height, age, ethnicity, life experience and interests: Kathryn, Pam, Janet, Louise, Alison, Anna, Amanda, Ann, Janine, Phillipa, Georgie, Yvonne. Together, we set to work in the cold and dilapidated Winter Gardens, a derelict theatre with brickwork reminiscent of an old factory. Like the women and girls at White Lund 100 years ago, we worked on repetitive actions, our own actions from our everyday lives. We are all experts in the movements that we do everyday, and it’s my favourite myth to dispel when someone tells me that they ‘can’t dance’; we are each virtuosic in our own personal choreographies. 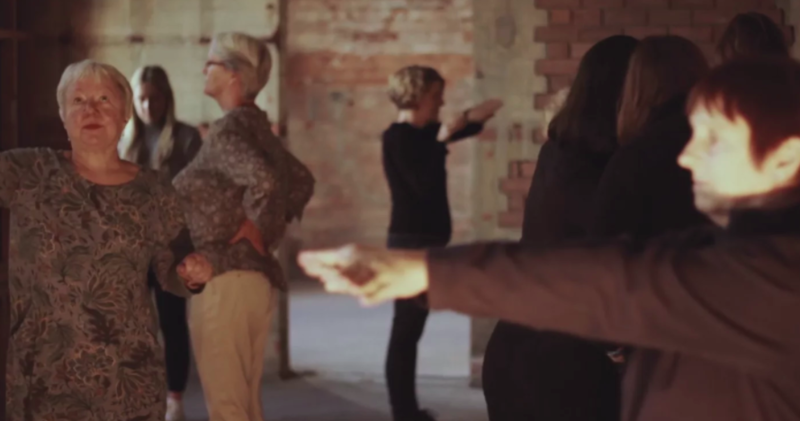 We focussed on the movements that fit us like a glove, whether at home or at work, and very readily the group recognised how well placed they were to perform these ‘autobiographical choreographies’. We revisited ‘body memories’ we have held from years of working, in whatever capacity - movements that we’ve made repetitively, repeatedly, in our work places over the years. We moved through the shattered building like a pack. We moved old doors and counters and covered up windows and unreeled tens of metres of cable and fired a vast wattage of light across the floors. And then together we made slow and considered sequences of those movements which our bodies know so well, with the purpose of filming them. We created an understated and quiet film as a fitting tribute to the women who spent their lives being calm durational experts of their own bodies. White Lund Commemoration from Adam York Gregory on Vimeo. The accumulation of objects can have a startling effect on people – the overwhelming realisation that although some objects are close to you, they are then repeated hundreds of times out of view. It can offer a great deal of perspective, both physically and emotionally. Adam and I felt strongly that we didn’t want to sensationalise the explosions at White Lund, and felt a more fitting response would be to gently commemorate. We have created a few hundred bespoke, small votives, which each emit a constant light for about 4 days, the same duration as the explosions at White Lund. They will fill one half of the museum as a quiet commemorative vigil for the duration of Light Up Lancaster, and we hope that the accumulation of such small light objects will offer a little perspective on the scale of the disaster of October 1st, 1917. We wanted to make an artwork that takes viewers on a physical journey through the museum, taking in three distinct, but associated elements. We are interested in the lives and actions of people living in this city now, both young and old, and how, through them, we can reflect on a particular historical moment with such local significance. With local school children, using the science of explosions and the tension they create, we developed a unique animation accompanied by explosive soundscapes, generated by the ‘body as source’. We made a film that was the meeting point between our practice as artists and commemorative actions; using everyday repetitive movements, we drew parallels between the recurring and often laborious activities undertaken by the women who worked at White Lund, and those of the local women of Lancaster and Morecambe working today. Finally, we created a landscape of light objects to act as a votive, a vigil of light in the chaos and sporadic explosions of White Lund. We hope we have made a fitting commemoration.